Most of us can recall a childhood visit to a planetarium: the sense of anticipation, the room darkening, the stars coming up, the voice of the astronomer. In the planetarium, the wondrous complexity of the cosmos combines with entertainment in a theatre of the night. But how and where did the planetarium originate? What kind of simulation of the solar system and the universe does the planetarium produce? How does the planetarium mix theatre with science? And how has it changed with developments in astronomy? Star Theatre explores the history of this unique building, designed to reveal the universe around us on an ever-expanding scale. It traces its historical origins, from the early precedents for the planetarium, to its invention in Germany in the 1920s, its developments in the USSR and the United States, its expansion across the globe at the time of the space race and the evolution of the contemporary planetarium in the recent period of startling astronomical and cosmological discoveries. 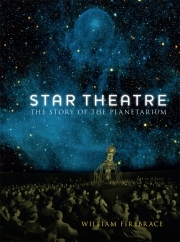 This concise, well-illustrated history will appeal to planetarium lovers as well as those interested in astronomy, architecture, theatre and cinema. William Firebrace is an architect and the author of Things Worth Seeing (2001), Marseille Mix (2010) and Memo for Nemo (2014). He is based in London.